Warehouse management is the art of movement and storage of materials throughout the warehouse. It involves the physical warehouse infrastructure, tracking systems, and communication between product stations. Warehouse management deals with receipt, storage and movement of goods usually finished goods and includes functions like warehouse master record, item/ warehouse cross-reference lists and such things as on hand, allocated, transfers in process, transfer in process, transfer lead time, safety stock, fields for accumulating statistics by location. A warehouse manager needs to perform several crucial functions such as overseeing and recording deliveries and pickups, loading and unloading materials and supplies, maintaining inventory records and tracking system, determining appropriate places for storage, rotating stock as needed and adjusting inventory levels to reflect receipts and disbursements. An individual handling the warehouse management needs to have knowledge about inventory control and warehousing systems, loading and unloading procedures, risky and materials storage and mathematical knowledge. For manufacturers and distributors alike, the warehouse is a critical hub through which everything must pass. A successful process moves raw materials waiting to be manufactured into finished goods to product waiting for shipment downstream to a distribution center, retailer or end-customer. Mobility can be integrated into all warehouse processes, transforming the warehouse into a competitive advantage. With the warehouse representing the last link of the supply chain, it’s vital to maintain a structured, error-free environment in the most efficient manner possible. Here are frequent problems found in warehouses, all of which can be easily eliminated by better processes or automation. A warehouse is typically divided into areas to support your every day processes. These areas include: reserve storage, forward pick, cross docking, shipping, receiving, assembly/special handling lines, and quality/inspection area. Redundant warehouse processes are detrimental to the success of your warehouse. Redundant processes are not only a waste of time, but they are also damaging to your employee’s productivity.Reevaluate your current warehouse processes and streamline workflows to boost productivity rates and optimize efficiency. Redundant process is often one of the highest motivators for adding mobile workstations to a workplace. The conventional approach to order picking optimization divides the process in three main decision areas: storage policy, order consolidation policy, and routing policy. In practice, there are variants of randomized storage in warehouses that range from completely ordered to completely unordered. An additional problem encountered in warehouses with randomized storage that is not addressed by the conventional methods of order picking optimization is item selection. The item selection problem is concerned with selecting a single product to pick from multiple products throughout the warehouse so as to satisfy a customer order. These problems can be improved by adding mobile workstations with power to a warehouse or distribution center. As a fast-paced progressive organization with high quality standards, learn how Amazon members of the receiving department need to resolve incoming product discrepancies very quickly. 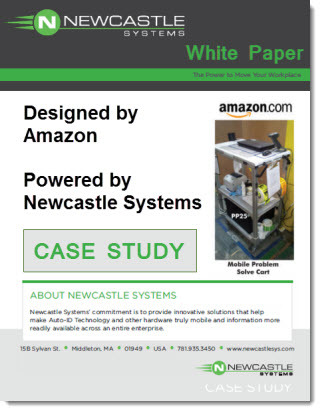 Access the case study white paper here.